#258: British Invaders Malcolm and Alwyn | mark Joseph "young"
This is mark Joseph “young” blog entry #258, on the subject of British Invaders Malcolm and Alwyn. 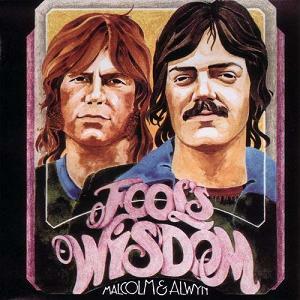 It was again the early 1970s; I had a pirated tape of their debut album Fool’s Wisdom. I’m not really certain what to say about them–call it mixed feelings. They were a short-lived band, producing only the two albums, the second called Wildwall. I’m sure I heard the second (I know I saw it), but I don’t recall anything from it. On the other hand, despite the fact that I must have listened to the first for several years (until my tape recorders died), I remember only two songs from it, although obviously listening to it now I recognize the rest. I think of them as good songs, and I’ll get to them in a moment. From the beginning, Malcolm Wild and Alwyn Wall struck me as the Simon & Garfunkel of Christian music, what was then called Jesus Music, but that they were a British duo. I thought they were very good, and they were certainly enjoyable. I did not know at the time that they had come to America and were friends with Larry Norman, but he wrote a song about them entitled Dear Malcolm, Dear Alwyn. The title song of the first album, second track Fool’s Wisdom, was all the rage in my first college. I was certainly not the only person who learned how to play it and could perform it, and indeed I performed it at my most recent concert, although I had not done so for decades, just because I’d promised to do some covers and it was a good one that I knew. One thing about Luther College is that there were a lot of singers there and not a few instrumentalists, and it was not at all uncommon for someone to start playing a familiar song and everyone to improvise harmonies. This song lent itself to that, and I’ll confess to having thrown in a few more modern sounds to the chorus than the original sported. It was well-loved because of that. I played another song from that album, though, one called Growing Old, fourth track. I liked it when I heard it, and I learned it (it was simple, really). I never played it in concert and never played it with anyone else, but every once in a while would play it just for myself. Then after my father died, I happened to try to play it–months later, no connection to his death–and almost didn’t get through it. When I put together the program for my next concert, I included it. It was the only song that got specific mention from audience members after a two-hour concert. I’m sure there were other good songs, and that I just don’t remember them. They released the first two albums in 1973 and 1974, then broke up, but reunited to do a live album in ’81. Both did solo albums, and both are now pastors. #256: Harry Thomas’ Creations Come Alive.